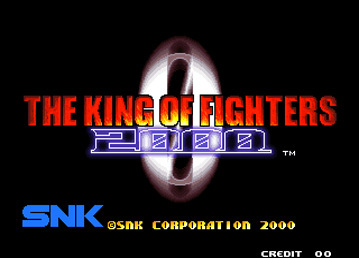 Such a dramatic title... And also the last stand for SNK, as gamers have known it in its glorious days. 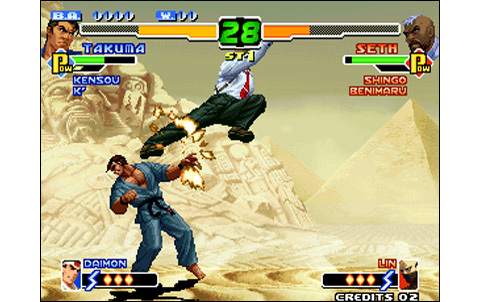 The historic company which made Vanguard, Ikari Warriors, The King of Fighters and Fatal Fury series is living its last hours. But what a finale my friends! 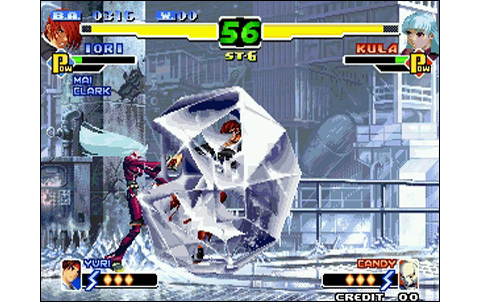 After two particularly good vintages for the KOF saga - a monstrous 98' "Dream Match", and a 99' inaugurating a new system of strikers, we could legitimately be intrigued about what SNK was about to do. 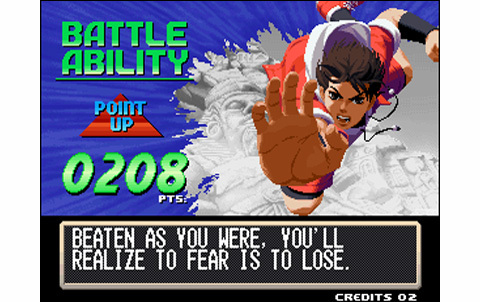 Another superb King of Fighters episode, worthy of his ancestors? Good pick! Once the cartridge is boot, it's great art all the way. 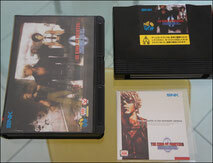 The game starts at top speed, with a dynamic intro, showing a few already known characters, some ghosts, and a few newcomers. After a brief demonstration explaining the new mechanics, we come to the character selection screen. 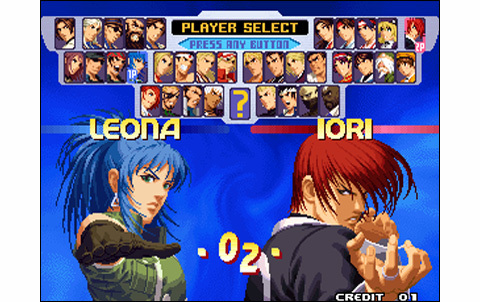 And once on this screen, we take a look at the wonderful roster: thirty-five selectable fighters (even thirty-six with code or unibios, by unlocking the boss Zero) is already remarkable, but what is even more impressive, is the new character design. 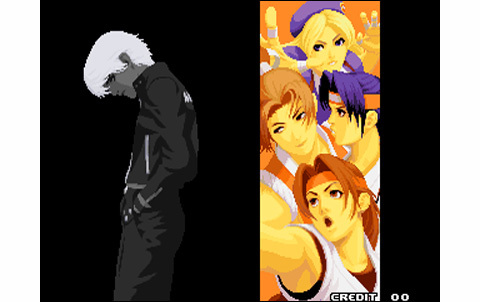 The faces of our heroes are purely sublime: the gallery features the most awesome portraits of KOF characters. These have been drawn by very talented graphic artists, to say the least. Quite simply, I think the design is the most successful of the whole saga. Our fighters are looking smarter than ever, crowned with glory. 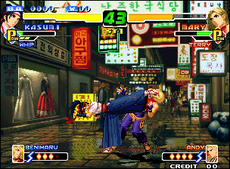 The gameplay needs no more explanations, as it's known for its technical aspect and millimetered precision. New "armor" & "counter" modes can be activated with power gauges, the game includes even more combos and specials, plus incredible new combinations with strikers. A rating system is now noting your performance at the end of the events. 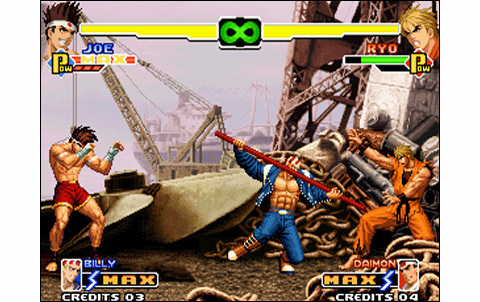 Significantly improving the strikers' system and offering a host of them (over eighty, with some that are hidden), the gameplay that was previously heavily re-worked in the 99' is reaching another dimension: the fighters/strikers combinations become nearly endless. You only have to let your imagination wander to find new ones... It's a treat. A downside, however: the game offers a lot of infinite and degenerate combinations. Not very fair, for sure... but still priceless to perform. What a joy to place these techniques on some good friends! 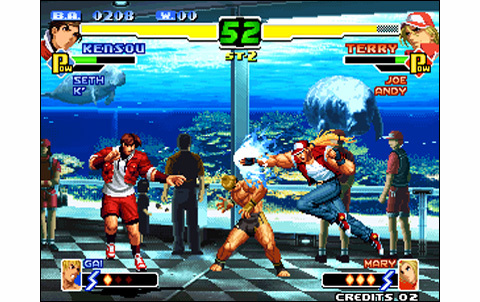 The range of moves for the fighters have been updated for some of them (Terry, Iori, Kyo...) and some new DM and SDM are also included. 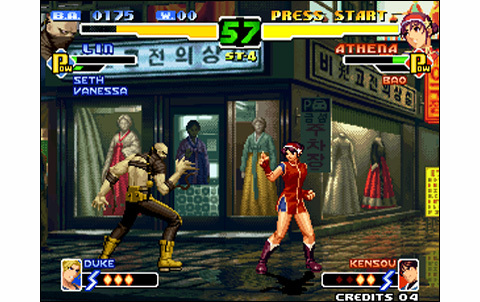 Among the newcomers, there' s Hinako, a young Sumo fighter, Kula, a Cyborg female who can freeze enemies; Ramon, a mexican wrestler quite fun to play, Seth, a big bully that can stop your punches with a counter throw (à la Geese Howard); Vanessa, a smart and fast female boxer, and the last but not the least, Lin, a formidable lanky ninja. 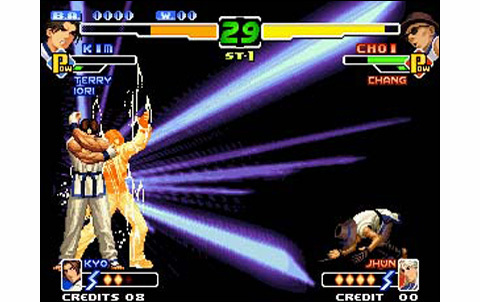 Coming to the strikers, you' ll find among them some icons that will delight SNK fevers: Geese, Duke from Burning Fight, Rocky from Robo Army, Fio from Metal Slug, or even Rugal and other surprises... Offering a concrete KOF gameplay, plus the fairly improved strikers system, our 2000 opus not only displays a number of moves and combos that ridiculizes other fighting franchises, no: the game is also absolutely gorgeous. Animations is very dynamic, with a remarkable decomposition, the characters are finely drawn in every posture; melodies, sound effects and countless voices fit perfectly the action, setting a great ambiance. 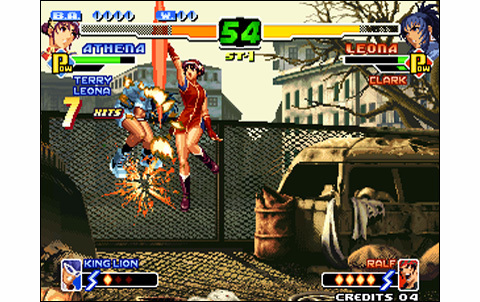 If a reproach can be formulated to SNK and one only, it's the limited number of backgrounds. Seven total, it's just too few... As the years passes, the editor includes lesser and lesser stages in the games of the saga! Certainly it's just a detail, but it was cool to have varied environments for the combats. 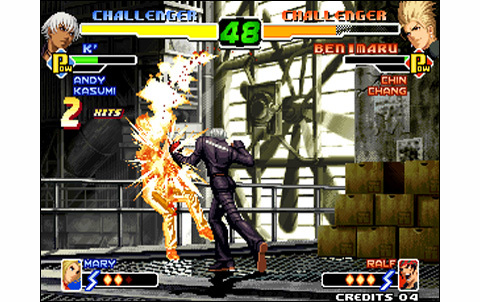 The difficulty is well set, the versus game still causes many endless nights: after all, what more could we ask to a fighting game? 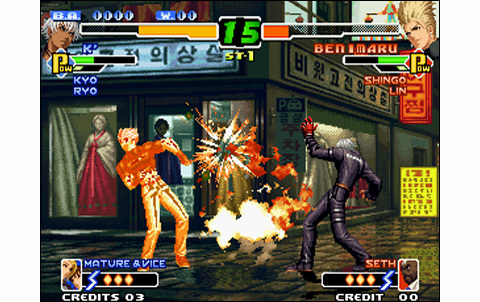 Released next to the great Garou: Mark of the Wolves, The King of Fighters 2000 follows the same path of quality, while maintaining the brand that made the success of the series. 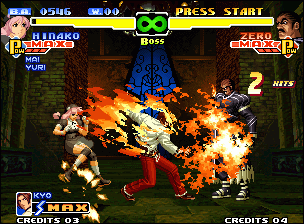 The roster is monstrous, the gameplay is extremely rich, and still reaches the top of what the Neo Geo can offer. 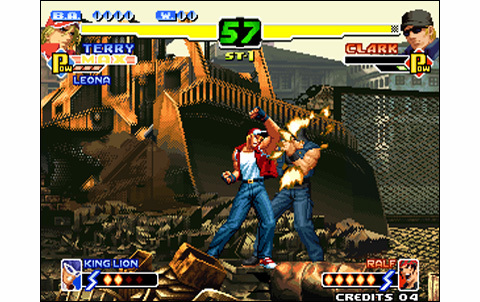 The seventh game in the King of Fighters series is now part of the SNK legacy, which remains one of the best company of the arcade videogames world. Marvelous character design, sublime - but too few - stages... And for characters' sprites, it's fine and detailed, as usual. 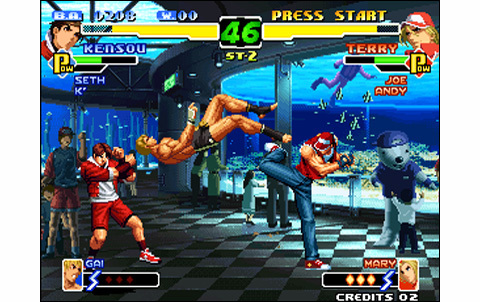 KOF 2000 features the best animation ever seen in a game of the saga. New catchy themes, effects and voices still excellent, and great voices for the newcomers too! 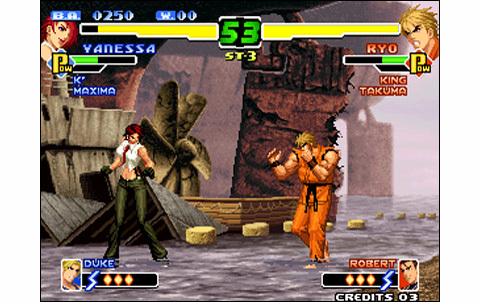 Thirty-six playable characters, twice as much strikers, thousands of combos... What else could we ask for? Basics are the same as in Kof 98', plus the strikers system that provides even more fun and depth to the game. 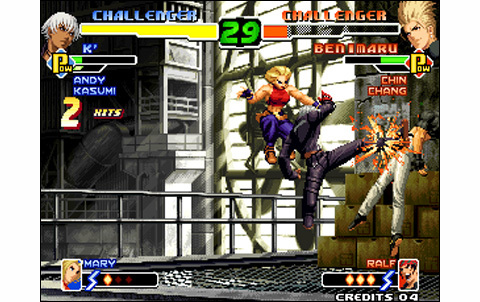 In a slightly different way of playing than Kof 98', this episode offers an equal amount of fun. 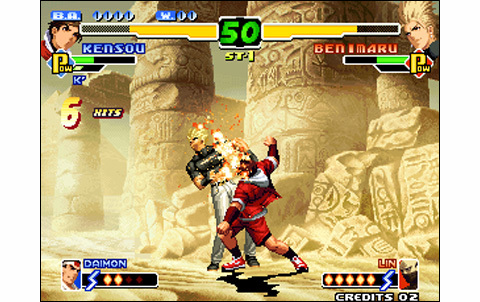 Rarely getting over 100 euros, this KOF episode deserves all your attention. 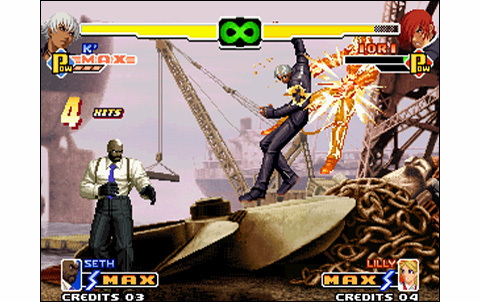 It's the best of the series using the strikers, so clearly a first pick if you wish to try all "different" Kofs. It will raise from its box regularly to provide epic fight nights!